Subscribe to our weekly newsletter and receive local, national and international Christian news by email every Friday. You can SUBSCRIBE to our newsletter for free by following the instructions below. Thereafter, please consider becoming a SUPER SUBSCRIBER and paying a small VOLUNTARY subscription fee to help us to bring Hope in Jesus through news and to provide Christians with a much-needed voice in the news realm. I give gatewaynews.co.za permission to collect and use my data submitted in this form. Now that you are a newsletter subscriber, please prayerfully consider becoming a SUPER SUBSCRIBER. Please CLICK HERE to find out more about this key opportunity to bring Hope and impact nations through Christian news. Well done! Looking forward to receiving the regular newsletter! Looking forward to keeping ‘in touch’ thanks for your publication.Blessings. Please email me your newsletter regarding Port Elizabeth on a regular basis. This Christian news update of PE is so welcome! Ek het van julle gehoor op KMMC. Pleae email me your weekly news letter. Congratul;ations in joining the battle to get the message of not only salvation but also VICTORY into the airwaves and in the scramble of the multi media Light into darkness!!!! Thank you that I can be part of this. Together we are going to change the land. just heard about this website on radio ccfm. Looking forward to receiving the newsletter. just got connected to the website. Think competition is already closed but I would love to go to PASSION CAPE TOWN. Aah! You missed the competition but you can still purchase tickets online or at the gate. Welcome to Gateway News — and help us spread the news by encouraging your friends to subscribe to our free newsletter and like us on fb! Please send me a prayer cloth. You will need to address your request to GOD TV (www.god.tv). You will find the info you need on their website. Looking forward to your weekly updates. I might be changing my email address over the next few months. My cell number is 0724712179. Thank you all for standing for the Truth.God’s Blessing’s. Our country is burning and our children are the victims. Only with Christ on our side can we extinquish those destructive flames. Positive and uplifting news every week with a Biblical worldview. Thank you for this publication. 2013.Sien baie uit na 2014 se briewe.M M C het my hele lewe . HEMEL is.Lekker om die woord te hoor . Thank you for this. I live in England now but have put the town I came from! It’s good to hear your wisdom again. Thank you for this.looking forward to receiving the good news. I would love to receive this weekly newsletter. Please may i ask for a weekly review on the topics or articles of your liking from the weekly publish of Gateway on our news current affairs show that now starts at 14;30 every Friday. Tot dusver geniet ek en my familie `n rustige en gees vervullende paasnweek. dit herinner aan Jesus se vreedsame heengaan. I will appreciate it receiving the monthly Christian News. Praise God for your initiative. I would also like to be part of helping Christians by placing articles in the Newsletter. Is that OK? Praise The LORD for gateway news! may our Great GOD bless you,Andre and team! I am a fellow believer and I thank you for setting up this platform for the Body of Christ. I am available for any assistance that you might need. for an example if you want to promote this platform among the Christian brotherhood and you need extra hands for assistance, give me shout and I will be there. I looked at your archive and the news/articles is what we need to encourage us to fight the good fight and to bring others to Jesus. Thank you very much and keep up the good work. I look forwrd to receiving Getaway News. We have to ignore the information overload!! Bless your work for the Lord. 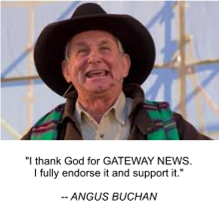 I look forward to receiving Gateway News. Thank you. CHRISTIANS UNITE TO FIGHT THIS ATTACK ON OUR BELOVED SAVIOUR! A DISRESPECTFUL AND BLASPHEMOUS PICTURE OF JESUS CHRIST APPEARED ON DSTV / MULTICHOICE ON THE ZALEB PROGRAMME ON THE CHANNEL GLOW ON 22 JULY 2015 AT +- 16H30. IT WAS AN OFFENSIVE PICTURE DEPICTING JESUS CHRIST WITH A PAIR OF SUNGLASSES ON CARRYING A GIRL OVER EACH SHOULDER SHOWING THEIR NAKED BOTTOMS. We are in end times. Know the armour well, put it on daily. Ephesians 6. 10 – 18. Then STAND. The most glorious and wonderful helper, the Holy Spirit,is right beside you waiting for your invitation. Andre, I am HIS testimony as the Lord said I would be… was saved from death at many occasions and helped through many tribulations testifying wherever I am needed, Your invite to gateway news is a honour to proclaim to works of God. Thank You for this great opportunity and all round communication. Blessings to all! I’d really love to be empowered with spiritual food. Keep on fighting anti-christian impact on our children. Please forward ongoing articles regarding the Halaal hoax and impact thereof urgently. Where can I join for boycotting it. (2) The millions of very poor people in our country are being taxed by Islam organisations to pay a surcharge on products they already hardly can afford to buy. Is their any petition Christian organizations started against this halaal certification, which 98% of our non-Muslim population in South Africa never asked for and do not want, which I can support? We need a Godly Government in South Africa. Christians, we need to unite as never before against all unrighteousness including the halal certification of food. Check http://www.itstimetopray.co.za and lets get God fearing men and women elected as leaders on every level of society. 10-09-2018 The Spirit of the Lord come before me in a dream: I was coming in the the village where no strangers are allowed without permission from the authority. I see myself coming in unnotice me. I wonder why, I ask myself, am I a ghost? I come in passing by people in groups. Most members of the groups are slowly feeding as if they are blown away bu a strong wind. One group notine my presence and they are asking for my prayers so they will not be blown away by the strong wind. I woke up and the Spirit of the Lord come before me saying: “ I do not know what to do. Paul got even. Sorrow got waiting for the world ring will come. Like slowly you know. Like Hurricane. Gently moving from the south African contries. Devastation! How must the future I have? The Lord knows your heart. You casnnot hide it from Him. Remember when we are totally commited to Him, He watches over us, keeping us from harm. Remember when the army of Syria had been sent to arrest Elisha, although his servant was fearful; Elisha said there are more for us than against us. Elisha prayed, asked the Lord to open the eyes of his servant.Great was his astonishment when he saw there were myriads of angels and chariots surrounding Elisha and his servant. When the Syrian army came for them; Elisha asked for the eyes of the Syrians to be blinded. The Lord answered and the Syrians could not recognize God’s prophet. Elisha then leads them to the king of Israel. He asks Elisha should he slay them? Elisha said no, but instead instructed the king to give them food and drink, then send them on their way. After this incident, the syrian raiders, never returned to the land of israel. At times the Lord hides us in the midst of the world, making us invisible to they who would oppose us for our protection. Remember our Lord cares for all whom dilligently seek His Face! how great to hear good, christian instead of all the doom, gloo, negative news on national TV. Truly the Revival has come. The Lord has heard His people cry and is set to deliver this nation.